iPad Piano Lessons: The Definitive Guide To Musiah for iPad. This page is currently in development to provide additional information about Musiah for iPad (released December 1, 2018). We'll be adding images and videos in the coming days, so please be sure to check back for additional content soon. This guide has everything you need to know about piano lessons for iPad. If you're wanting to learn about ipad piano lessons generally, I'll show you how to get started. And if you're seeking to learn about the best iPad piano lessons online today – Musiah, this guide takes you through all the amazing app features in detail with tutorials, videos, tips and insights on each area of the app. And you'll also learn how Musiah teaches. If you to get the very most out of your iPad piano lessons with Musiah, you'll love this guide. In this chapter, I'll show you how to get started. First, you'll learn how to get a 14 Day Free Trial. Then, I'll help you download and install the app, add students to your account and start your lessons. Simply tap the green Try Free button in the top right of this screen. Once you've signed up, log in and under the Downloads tab, you'll see a link to the app. The first time you launch the app a login screen appears. So you enter the email address and password associated with your Musiah account. There is an option to ‘Remember these details’. So place a check in this checkbox and you won’t need to enter your login details each time you launch the app. Once you have logged into the app, you will arrive at the Student Profiles screen. Here you can create one student profile (on a Single or Single Saver Plan) or up to 6 student profiles (on a Family or Family Saver Plan). A student can be yourself or any member of your immediate family. To create a student, tap the ‘Create Student’ button. This will take you to a form where you can fill in the details for the student you wish to create. If you prefer not to enter your actual date of birth, please at least enter one that is close to your actual age as this will assist us to provide advice (when requested) that is appropriate to the age of the student. Pure Mode offers pure tuition with no story content / animations. Some adults may prefer this mode. Story Mode is for the young and the young at heart (many adults enjoy story mode). In this mode, the student is the central character in a story that is set in the future. Within the context of the story, the goal is to save the galaxy from the Atonals — a race of invading machines — by completing the course and unlocking ‘The Lost Song’ — a mysterious piece hidden within the course textbook that has the power to repel the Atonals. Most of the other settings are self-explanatory. When you have finished entering the student’s details and selecting your preferred mode and theme, tap ‘Create’. To begin your lessons, on the Student Profiles screen, tap your student profile. If you chose Pure Mode when creating your student profile, you will be taken directly to the Main Menu. If you chose Story Mode when creating your student profile, a video of ‘The Musiah Story’ will play, and then you will be taken to the Main Menu. You can skip this video by double-tapping anywhere on your screen. And you can view ‘The Musiah Story’ video at any time from the Main Menu by selecting ‘TREASURE’, then ‘VIEW MUSIAH STORY’. Anyhow, to begin your first lesson, on the Main Menu, tap ‘START LESSON’ (under Lesson 01 – Jack In The Box – RH Only). On the Main Menu, tapping ‘CONTINUE’ (the icon with a treble clef at the top of the screen) at any time will take you directly to wherever you are currently up to in the course. In this chapter, I'll cover how to use each feature on the Main Menu. Some are obvious, but a few may surprise you. There's a TON of features to help you navigate to different areas in the app as well LOTS of cool things you can do right there on the Menu. On the right hand side of the Main Menu is the Lesson List. At the top of the lesson list, the current level is displayed. Tapping on the right arrow reveals the list of pieces for the next level. Tapping the left arrow returns you to the previous level. Note: You can only access your current lesson or lessons you have already completed. Lessons you are not yet up to will be inaccessible. But what you can do is click on any lesson including future lessons to reveal and use the ‘PREVIEW PIECE’ feature. If you can't see any options for a particular lesson, simply tap on the Lesson Title to expland the view, revealing the available options. Tapping ‘PREVIEW PIECE’ enables you to hear what the piece will sound like with or without the backing track. Quick Tip: For an enhanced ‘preview piece’ experience, I recommend the DEMO function in the PRACTICE AREA which we’ll come to a little later in Chapter 5: Practice Area Features. Each time you arrive at the Main Menu, your current lesson will be pre-selected on the lesson list. If you have not yet started the current lesson, it will say ‘START LESSON’. If you are part way through the current lesson, options to ‘RESTART LESSON’ or ‘CONTINUE’ will be shown. If you tap on a lesson you have already completed, the option to ‘REPEAT LESSON’ will be displayed. At the end of each lesson, you will be required to ‘audition’ the piece for Musiah by playing it with a backing track. If you tap on a lesson you have already completed, the option to ‘AUDITION AGAIN’ will be displayed. Also, in your Student Profile (tap Edit Profile), there is an optional ‘Can skip to audition’ checkbox. This setting is suitable for students who have learned before. If this checkbox is enabled, on the Main Menu, the current lesson will display an option to ‘AUDITION NOW’. In other words, if you have learned before, you can choose to audition a piece straight away rather than going through a lesson before attempting the audition. At the end of each level, you will be required to complete a performance challenge in which you have to play 3 pieces in front of a virtual audience. The pieces will be randomly selected from the current level. However, in order to unlock the performance challenge, you need to earn the required number of stars (on average around 41⁄2 stars for each piece). For example, in Level 1, there are 95 stars available. 85 of these are required to unlock the performance challenge. So here, it says 0 out of 85 required stars because this student has not yet started. Once you have earned 85 or more stars, the text at the bottom will change to “Performance Unlocked!” Tap ‘START PERFORMANCE’ to begin the challenge. So as you progress through each level, be sure to revise and continue improving any pieces for which you have earned less than 5 stars. 1) KNOWLEDGE – here you can review all the items of knowledge you have learned so far in the lessons you have completed. 2) NOTE & REST CHART – this chart shows all the note and rest values and is here for revision purposes. 3) CLUES (Story Mode only) – here you can revisit clues relating to the storyline that are collected as you complete pieces. 4) VIEW MUSIAH STORY (Story Mode only) – here you can view ‘The Musiah Story’ video at any time. Tap MENU to return to the Main Menu. Next we have Practice. Tapping this brings you to the PRACTICE AREA which we’ll cover in Chapter 5: Practice Area Features. In the GAMES AREA, where you’ll find various games designed to help you improve your note reading, note playing, musical memory training and ear training. And there’s a separate video on the Games area a little later. Why is there a map? Well, in Story Mode, the performance challenge at the end of each level takes place on a different planet. As you complete each lesson you will advance closer to the next planet you will be visiting. In all, there are 13 planets to visit. And the PROGRESS MAP shows your current position in the galaxy. Tapping CONTINUE brings you to where you are currently up to in your lessons. So instead of tapping Continue on the current lesson on the Lesson List, you can just tap CONTINUE’ up here which does the same thing. In case you’re wondering what this spinning thing is in the bottom left of the Main Menu… In Story Mode, as you complete the performance challenge at the end of each level, you will receive 1 of 13 pieces of a special key called a CLAVITRISK. And this is the Clavitrisk. In the bottom left corner of the Main Menu, you can see how many pieces of the CLAVITRISK you have collected (in Story Mode only). Once you have collected all 13 pieces of the clavitrisk, you will be able to unlock ‘The Lost Song’ — a mysterious piece of music that is hidden within the textbook you are studying. According to legend, ‘The Lost Song’ has the power to repel the ‘Atonals’ — a race of ruthless invading alien machines intent on destroying the galaxy. (For more details, watch ‘The Musiah Story’ video). Near the top right of the screen, under the avatar image, we have ‘VIEW PROFILES’. Tapping this brings you to the Student Profiles screen. Here you can select a different student profile e.g. if a different family member wishes to learn. ‘EDIT PROFILE’ opens the screen where your student profile details and settings were entered when you first created your student profile. Once you have made your desired changes, tap ‘SAVE SETTINGS’. Then tap ‘MENU’ to return to the Main Menu. Each time you arrive at the Main Menu, a different TIP on how to get the most out of the app’s features is displayed. You can also scroll through the tips by tapping ‘NEXT’. Under HELP, there’s a really useful User Manual. But if you are experiencing a technical issue or possible bug, simply tap ‘HELP’, and then ‘SUPPORT TICKET’. Ideally try to get to this form literally as the issue is happening (as opposed to afterwards). For general inquiries, please contact us via the contact form on the website rather than raising technical support tickets. Next to HELP, there’s a SETTINGS area which we’ll cover in Chapter 8: Settings. In this chapter, I'll cover the the many wonderful features of the Lesson Area. Being aware of the wide range of available features will help manage challenges, get more from your lessons and tailor your lesson experience to just the way you like it. First of all, there’s a really useful feature that you can’t see... By double tapping on your iPad screen, you can skip the current phrase in Musiah's dialogue at any time. This is really handy if you want to restart a module without hearing the intro phrase again, and it's one of my favorite features because it's so intuitive. Also, during certain feedback, such as “Here’s what you played... Here’s how it’s meant to go,” a SKIP FEEDBACK button is displayed. You can skip the feedback by tapping this button. … which is short for ‘Instrument Volume’. This adjusts the volume of the virtual instrument relative to the click track or backing track. Next, there’s the instrument which changes from lesson to lesson. Now, if you don’t like the allocated instrument, tapping on the Instrument button changes the instrument to Piano. Tapping it again switches back to the allocated instrument for this lesson. Then there’s the "Back" button which steps back to the previous lesson module. The "Pause / Play" button pauses / restarts the current lesson module. This is useful if you want to try something again straight away. The "Advance" button steps forward to the next module. Just a quick note: This function is only enabled when repeating a lesson / module, so you can’t advance to modules you’re not up to yet. This here is the "Quick Restart" button which instantly restarts the current lesson module. Unlike the Pause / Play button, when the Quick Reset button is used, the intro dialogue will not be replayed. So you'll literally be able to start the current module again straight away. This is useful if you realize you've messed up and you quickly want to try again, bypassing the feedback and the intro dialogue. PRACTICE pauses the lesson and takes you to the PRACTICE AREA so you can practice the current segment of the piece on your own before playing it for Musiah. For example, in a lesson module where you are required to play Bar 2 with both hands along with the click track, tapping PRACTICE takes you to the PRACTICE AREA where you will find the current segment (Bar 2) has been pre-selected. When you tap PLAY, the click track and cursor will just take you through Bar 2. If looping is enabled, you will be able to loop through Bar 2 as many times as you wish. To return to the lesson, tap "CONTINUE LESSON". The "Tempo" slider controls the tempo of the click track in lesson modules where you are required to play along with a click track. As you begin each lesson, the slow tempo is recommended and is selected by default. On a side note… Here in the lesson area, tempos are restricted to slow, medium or full. In the "Practice Area" (accessible from the Main Menu), custom tempos are available. We’ll learn more about the Practice Area in Chapter 5 a little later. In landscape view, tapping this keyboard icon reveals an On Screen Keyboard which you can use to play piano notes by tapping the keys on your iPad screen. Tapping the ON SCREEN KEYBOARD icon again hides the On Screen Keyboard. Now, the On Screen Keyboard is only displayed during lesson modules where you are required to respond by playing piano notes. During explanations and / or lesson modules where you are required to respond by tapping buttons on your iPad screen, the On Screen Keyboard is not displayed. Also, the On Screen Keyboard is not available in portrait (3:4) view. And at the risk or stating the obvious, the On Screen Keyboard is not intended to replace an actual MIDI keyboard. It should only be used on a very temporary basis, e.g. if you want to try the lessons before committing to buying a MIDI keyboard. And at the top left of the screen, we have ‘MENU’. Tapping this returns you to the Main Menu. Tapping ‘CHART’ reveals a chart that shows all the notes from the current piece and how they look both on the sheet music and on your piano keyboard. And you can drag the chart around. ‘NAV’ is short for Navigation and opens a list of every module in the current lesson. Modules you can access are shown in white… that’s all lesson modules up to and including your current module. Modules that are currently inaccessible are greyed out, so the next lesson module will be unlocked when you complete the current one. Settings, we’ll deal with in separately in Chapter 8. Under HELP, you’ll find a User Manual. And if you need technical support, simply tap ‘HELP’, and then ‘SUPPORT TICKET’. In this chapter, I'll take you step by step through the many flexible features of the Practice Area. There are LOADS of really neat features you can use to customize your practice, which will help you progress faster and learn more effectively. To get to the Practice Area, tap ‘PRACTICE’ either on the Main Menu or in the Lesson Area. Once you are in the Practice Area, you can practice a piece or a selected section of a piece with a backing track or click track, with the option to loop with or without breaks, set custom tempos, and so on. You’ll receive live, instant feedback in the form of highlights in various colors as you play, and a score for notes, timing, duration and an overall score is displayed (even when looping) at the end of each play through. Here are some of the colors you’ll see while you play. If you want to select a section of a piece, you can simply tap on the music stave and drag over the area you want to practice and a selection area will appear. Also, you can refine or change the selection using the Start Bar/Beat and End Bar / Beat selection drop-downs on the control panel. To clear your selection, just tap the ‘RESET’ button. The ‘Practice With’ setting lets you select whether you want to practice with both hands or just the left or right hand and you’ll receive feedback and scores that match your selection. This setting also affects whether left, right or both hands will be played when using the DEMO function. PLAY with click track lets you to play the piece (or a selected section of the piece) with the click track. When playing with the click track, you can also LOOP through the piece (or selected section of the piece) with or without breaks between each iteration. PLAY with backing track lets you to practice for auditions or performance challenges by playing the whole piece with the backing track at either medium or full tempo. (This feature is intentionally not designed to be used for practicing selected sections of a piece or at custom tempos). But what you can do when playing with the backing track, is you can also LOOP through the piece with or without breaks between each iteration. The LOOP feature is very useful if you want to practice something over and over in a continuous loop. When playing with a click track or backing track, try looping with or without breaks. As you complete each iteration, you’ll receive a score for notes, timing, duration and an overall score. The metronome icon turns a metronome on or off. This is handy if you just want to practice something on your own without any feedback. The tempo of the metronome is controlled by the tempo slider. Custom tempos can be set using the tempo slider, for example by positioning the slider somewhere between ‘slow’ and ‘medium’. Or you can manually type a number in the tempo field to set a custom tempo. As an example, this is useful if you want to go slower than ‘slow’. 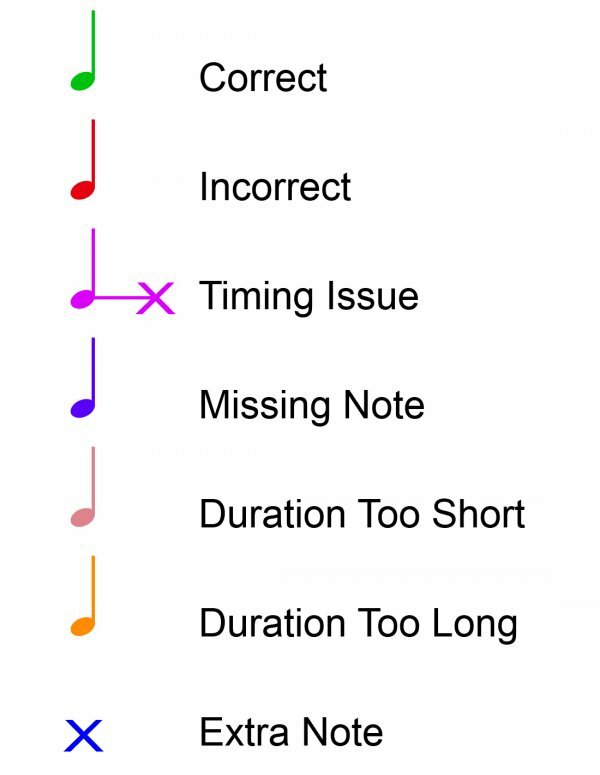 On a side note… In the lesson area, tempos are restricted to slow, medium or full. Only in the Practice Area are custom tempos are available. PRACTICE UNTIMED is useful if you just want to practice the notes in the left hand, right hand or both hands without worrying about the timing. DEMO with backing on plays the whole piece and shows you visually when the notes should be played with the backing track at either the medium or full tempo depending on the currently selected tempo on the tempo slider. When demoing with a backing track, if a tempo other than medium or full is selected, the app will adjust the tempo to either medium or full depending on which is closest to the currently selected tempo. The ‘Practice With’ setting also affects whether both hands or just the left hand or right hand will be played when using the DEMO function. DEMO with backing off plays the piece (or selected section of the piece) and shows you visually when the notes should be played at any custom tempo. Use the inst vol (instrument volume) to adjust the volume of the virtual instrument relative to the click track or backing track. Tap on the name of the instrument to switch between the allocated instrument for the current piece and a piano sound as an alternative instrument. Tap again to return to the allocated instrument. In the PRACTICE AREA, in landscape (4:3) view, an ON SCREEN KEYBOARD is displayed at the bottom of the screen. This enables you to play piano by tapping the keys on your iPad screen. At the risk of stating the obvious, the On Screen Keyboard is not intended to replace an actual MIDI keyboard. It should only be used on a very temporary basis, e.g. if you wanted to try a few lessons before committing to buying a MIDI keyboard. The On Screen Keyboard is not available in portrait (3:4) view. At the top of the screen, CHANGE PIECE brings up a list of all pieces on the course. Pieces you can access (all pieces up to and including your current piece) are shown in normal text. Pieces that are currently inaccessible are greyed out. So the next piece will be unlocked when you complete the current piece. Tapping CONTINUE LESSON in the PRACTICE AREA has the same function as tapping CONTINUE on the Main Menu — it takes you take you directly to the lesson area to wherever you are currently up to in the course. And in the top left, tapping ‘MENU’ returns you to the Main Menu. ‘CHART’ reveals a chart containing all the notes from the current piece and how they look both on the sheet music and on your piano keyboard. The SETTINGS area we’ll cover in Chapter 8. If you need technical support, you can tap ‘HELP’, and then ‘SUPPORT TICKET’. From the Main Menu, tapping Games brings you to the Games menu where you can choose from 4 types of games. There’s Note Identification (which is Note Reading), Note Playing, Memory Training and Ear Training. In this chapter, I'll take you through each of the settings in the Settings area and explain what each one does. The first one is LIVE FEEDBACK. This setting is enabled by default. When enabled, errors in your playing are highlighted in various colors as you play with either a click track or backing track. Removing the check from thE checkbox turns this feature off. Assuming live feedback is enabled, the colors you'll see are the same as the ones picutred above in Chapter 5. This setting is also enabled by default. The only time you should remove the check from this checkbox is if you wish to hear the sound from your MIDI keyboard instead of the Musiah app. This section shows the status of your MIDI device (which can be your MIDI keyboard or MIDI-to-USB cable) as either ‘connected’ or ‘not detected’. Any MIDI keyboard with 4 octaves (49 keys) or more is compatible with the Musiah app. If your keyboard has 4 octaves, make sure ‘4 Octaves’ is selected. If your keyboard has 5 or more octaves, make sure ‘5+ Octaves’ is selected. If your MIDI keyboard is touch sensitive, Keyboard Sensitivity adjusts or restricts the amount of touch sensitivity to make it easier for beginner students to control the volume of their playing. For most students, it is recommended to leave this setting at the default of 15%. If you want to make your playing more expressive or responsive, try increasing the keyboard sensitivity by moving the slider to the right. In this vidoe, I'll just comment on this briefly, give an example and mention a separate (more detailed) video on this topic. 1) Make sure Bluetooth is turned ON under your iPad's Settings. 2) Enable Bluetooth on your Bluetooth adapter or Bluetooth enabled MIDI instrument. 3) Launch the Musiah app, and under Settings, tap the Connect Bluetooth MIDI Device button. You should then be able to see a list of available Bluetooth MIDI devices and select your Bluetooth adapter or Bluetooth enabled MIDI instrument. To test your MIDI keyboard, follow Steps 1 and 2. If you cannot hear your keyboard, and there is no movement visible on the audio meter, refer to our FAQ on keyboard detection issues. If you’re a home user, you normally would not need to tap ‘LOGOUT’. An example of where you might want to use LOGOUT is if a visitor comes over who happens to have a Musiah account of their own, and they want to do some lessons on their own account, tapping ‘LOGOUT’ will bring you to the LOGIN SCREEN where you (or your visitor) can login to your preferred Musiah account. For school students using the app at school, it’s a little bit different. At the end of your lesson, you should log out or simply exit the app. The school version intentionally does not remember login details so the next student using the app will login with their details.